Famous Italian tenor, Andrea Bocelli is making his way to New York City’s Metropolitan Opera House to perform along with pianist, Vincenzo Scalera. The two talented artists will recite the beautiful music of Beethoven, Wagner, Liszt, Toti, Bocelli’s masterpieces and more. The show will commence on February 13, 2011 – will you be here to experience the magical sound of Bocellii and Scalera? 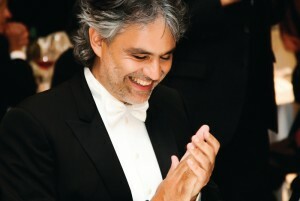 Andrea Bocelli has performed all around the world and has awed audiences with his angelic voice. This gifted singer grew up on a small farm in Tuscany, Italy with a loving family. Bocelli’s parents express Andrea’s deep passion for music; a passion that calmed him. By the age of six, Andrea Bocelli could play a multitude of musical instruments and became deeply engaged in singing by the age of 14. Unfortunately, Andrea’s battle with congenital glaucoma, a problem known from birth, became progressively worse and by 1970, at the young age of 12, Andrea Bocelli became permanently blinded after a tragic soccer accident. Andrea Bocelli has never let his disability hold him down. He has since his childhood, continued to perform and influence nations with his touching operatic music. The entire world knows Bocelli and his esteemed reputation has made him the biggest-selling solo artist in the history of classical music. Check out Bocelli singing one of his famous songs below. This is what i was looking for. thanks for sharing it. After browsing the internet I found this page and I gotta say I loved it from the start. It’s now bookmarked. Amusing, I really had this on my mind a few days ago and now I come across your website! Youre so cool! I dont suppose Ive read anything like this before. So good to search out somebody with some authentic ideas on this subject. realy thanks for starting this up. this website is one thing that is needed on the net, someone with a little originality. useful job for bringing one thing new to the internet! I’m so lucky to have discovered this blog page. You practically told me exactly what I preferred to hear and then some. Beautiful publication and cheers again for doing this no cost ! ! . I think that there is a point in this. Pleased to be able to play a part. Wish you good luck. great points altogether, you just won a new reader. What might you recommend in regards to your submit that you just made some days ago? Any certain? Pretty good post . I just stumbled upon your blog and wanted to say that. I have genuinely enyed reading your blog posts. Any way I ll be subscribing to your provender and I hope you post over again presently …. Many thanks for writing this entry. It is really helpful for me. I wanted to check up and allow you to know how , very much I treasured discovering your site today. I’d consider it the honor to work at my office and be able to utilize the tips shared on your blog and also get involved in visitors’ reviews like this. Should a position regarding guest article author become on offer at your end, i highly recommend you let me know. Very interesting article and I invite you to my page on it you will also find interesting articles. Thanks for sharing your publish . I really enjoyed it. I put a link to my blog to here so other people can read it.